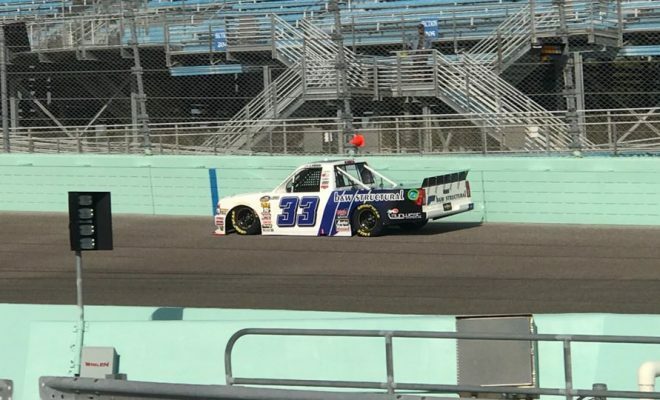 Friday kicked off a full day of events for the NASCAR Camping World Truck Series at Homestead Miami Speedway as drivers and teams prepared for the final race of the 2018 season. 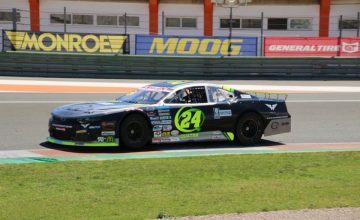 Robby Lyons was back behind the wheel of the No. 33 B&W Structural Chevrolet Silverado for Reaume Brother’s Racing for the first time since Talladega Superspeedway in October. 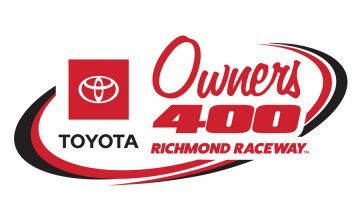 Lyons who finished 14th at that race in October picked right up where he left off when NCWTS practice took place on Friday morning. The 29-year old Florida native would finish first practice in the 21st position. Lyons seemed happy with how the truck was running, he had not only consistent lap times but was catching the trucks running in front of him at a solid pace. Lyons would improve greatly in the final practice where he would run as high as the 6th position. Ultimately, he rounded out final practice in 12th. As qualifying took place on Friday afternoon, Lyons would take his No. 33 Chevy to the top of the board early in round one. While it wasn’t enough to make the second round of qualifying it was a very successful session as he qualified in the 18th position with a lap of 165.73mph. When the green flag dropped Lyons spent most of stage 1 running in the Top-25. Lyons would bring his No. 33 to pit road for four tires, fuel and a track-bar adjustment at the end of the first stage and be scored in the 27th position, one lap down as the second stage began on lap 37. Lyons would consistently work his way back through the field as the second stage progressed. When the second stage ended, he was scored in the 24th position, still one lap down to the leaders. The team would opt to pit the second time around after the leaders for four tires and fuel. He would restart the final stage on lap 67 in the 23rd position, battling for the lucky dog. A concern of a tire rub would have Lyons falling back to the 27th position but with no signs or smell of smoke he would continue trying to make up the positions he lost. Ultimately, he would have to pit with a left front tire down, followed by a pass-through penalty issued by NASCAR for non-compliant fueling. With 34 laps to go in the final stage Lyons would pit for tires only to have to come back down pit road due to the right-side quarter panel rubbing. The remainder of the final stage would be all about learning what he could and improving his lap times. Robby would finish the final race of the season in the 27th position. A tough night, but a lot was learned for both driver and team as they’ll now turn their focus onto Daytona and the 2019 season. It’s full steam ahead on hard work and preparing for the 2019 season over the winter. Be on the lookout for Lyons and the 33-team next season.